WESTFIELD, Massachusetts - February 27, 2018 - The compact, flyweight design of the new Savage 110 Lightweight Storm offers the maneuverability to make the toughest shots in any situation coupled with the toughness to take on any weather. Shipments of these firearms are currently being delivered to dealers. Length-of-pull is easily customized to fit the shooter for comfort and consistency, and the user-adjustable AccuTrigger provides a light, crisp pull. 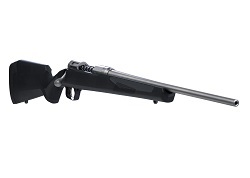 The rifle is built on Savage’s time-tested 110 platform, but with a modern design and improved ergonomics. Its detachable box magazine, stainless steel action, and 20-inch stainless steel barrel stand up to punishment from the most brutal conditions, yet tips the scales at a mere 5.65 pounds.